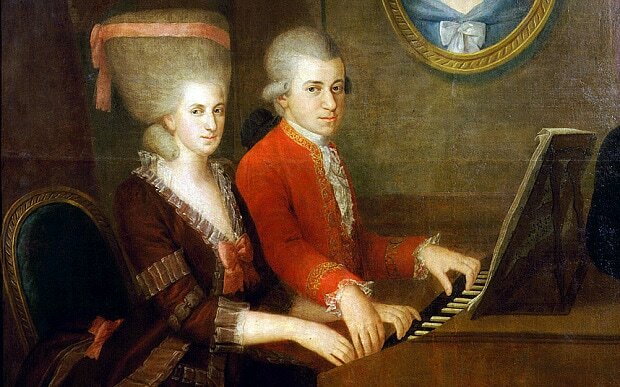 Maria Anna Mozart Was a Musical Prodigy Like Her Brother Wolfgang, So Why Did She Get Erased from History? | Open Culture Maria Anna Mozart Was a Musical Prodigy Like Her Brother Wolfgang, So Why Did She Get Erased from History? When people ask why we have specifically black histories, or queer histories, or women’s histories, it can be hard for many who do historical research to take the question seriously. But in fairness, such questions point to the very reason that alternative or “revisionist” histories exist. We cannot know what we are not told about history—at least not without doing the kind of digging professional scholars can do. Virginia Woolf’s tragic, but fictional, history of Shakespeare’s sister notwithstanding, the claims made by cultural critics about marginalization and oppression aren’t based on speculation, but on case after case of individuals who were ignored by, or shut out of, the wider culture, and subsequently disappeared from historical memory. One such extraordinary case involves the real sister of another towering European figure whose life we know much more about than Shakespeare’s. Before Wolfgang Amadeus Mozart began writing his first compositions, his older sister Maria Anna Mozart, nicknamed Nannerl, had already proven herself a prodigy. The two toured Europe together as children—she was with her brother during his 18-month stay in London. “There are contemporaneous reviews praising Nannerl,” writes Sylvia Milo, “and she was even billed first.” A 1763 review, for example, sounds indistinguishable from those written about young Wolfgang. With my braided hair I was called “little Mozart” by my violin teacher, but he meant Wolfi. I never heard that Amadeus had a sister. I never heard of Nannerl Mozart until I saw that family portrait. After discovering Nanerl, Milo poured through the historical archives, reading contemporary accounts and personal letters. The research gave birth to a one-woman play, The Other Mozart, which has toured for the last four years to critical acclaim. (See a trailer video above). In her Guardian essay, Milo describes Nannerl’s fate: “left behind in Salzberg” when she turned 18. “A little girl could perform and tour, but a woman doing so risked her reputation…. Her father only took Wolfgang on their next journeys around the courts of Europe. Nannerl never toured again.” We do know that she wrote music. Wolfgang praised one composition as “beautiful” in a letter to her. But none of her music has survived. “Maybe we will find it one day,” Milo writes. Indeed, an Australian researcher claims to have found Nannerl’s “musical handwriting” in the compositions Wolfgang used for practice. Other scholars have speculated that Mozart’s sister, five years his senior, certainly would have had some influence on his playing. “No musicians develop their art in a vacuum,” says musical sociologist Stevan Jackson. “Musicians learn by watching other musicians, by being an apprentice, formally or informally.” The question may remain an academic one, but the life of Nannerl has recently become a matter of popular interest as well, not only in Milo’s play but in several novels, many titled Mozart’s Sister, and a 2011 film, also titled Mozart’s Sister, written and directed by René Féret and starring his daughter in the titular role. The trailer above promises a richly emotional period drama, which—as all entertainments must do—takes some liberties with the facts as we know, or don't know, them, but which also, like Milo's play, gives flesh to a significant, and significantly frustrated, historical figure who had, for a couple hundred years, at least, been rendered invisible. If she was “erased from history” (according to your title, Josh Jones), where did the articles and painting come from? While fictional recreations of historical figures can be entertaining, such as Sylvia Milo’s one-woman play, and the 1980’s movie “Amadeus” (containing a very contemporary soundtrack, and considerable liberties taken with Amadeus’ relationship with Salieri), neither should be seen as historical references. They certainly do not support sweeping generalizations about gender politics in historical contexts, however much an internet blogger from 2017 may wish them to. Agreed, and the last part of the article where there are veiled claims that Mozart was only as talented as he was because of his older sister’s influence is just another attempt at re-writing history using bias to suit the minds of those that cannot live with the idea that geniuses male existed either without female counterparts or female intervention. That’s a total misrepresentation of the claim, which isn’t “veiled” and isn’t mine but from an academic researcher who is quoted in the Smithsonian article I linked to. He argues that Nannerl probably had some influence on Mozart’s playing, not that he “was only as talented as he was” because of her. No one is arguing that. You’re straw-manning the article because you seem to think there’s some kind of bias at work in writing about Mozart’s sister. I think there’s bias in not writing about her. Nearly every profile of Mozart includes significant discussion of his father’s influence. We rarely if ever hear about his older sister, even though she was also prodigiously talented and a major part of his young life. It seems to me totally uncontroversial to say that two sibling musicians who grew up playing and touring together would have influenced each other. I clearly state in the post that fictional representations take historical liberties–everyone knows that, so there’s no need for you to point that out as though you’re the first to discover it. The portrait is contemporary, and everyone at the time knew about her, as I also clearly state in the post. She was prevented from continuing her musical career, and in subsequent scholarship and popular representations of Mozart, she disappeared. It’s not that complicated. Any biography of Mozart is going to talk about his mother, who died while on tour with Wolfgang in Paris, and his father who was a composer in his own right as well as a musical patriarch, and Nannerl for whom the still-popular Concerto for Two Pianos, K.365 was composed (by and also for her brother, Wolfgang). The program notes for any performance of the piece will always discuss the sister who no longer toured but who was still part of her brother’s musical life. The played together at the same keyboard and had the same teacher (“Papa!”). “Airbrushed from history” is an exaggeration; I mean, I knew about her… But the article does a service in bring her to our attention, and reminding us of what is lost when we stifle individuals for whatever reason. Same. I also knew of Nannerl before. Of course, I am a music student…twice graduated…but, I think that it is not too difficult to find at least some historical credit for genius given to Nannerl. “Erased from history” is a bit of a stretch. However, I must say that I do think it’s neat to look at history from different angles. Another look at the first Mozart genius is not a bad idea. By only knowing Nannerl by descriptions of the duo’s touring, and not having any examples of her greater work (her compositions, her technique, personal histories), oh, and a portraiture, is about as “airbushed from history” as you can get. Just because someone can name her doesn’t make this an exaggeration. The information that we have is the smallest detail compared to what we may well have come to know…if she was a male. How many other Nannerl’s would there have been, had not only males been allowed to play in the artistic playground? Why is J.S. Bach the only Bach to get credit, when his own sons were even more famous than he was back in the day? Is there a contemporary agenda somewhere making this so, or is it just because of some small coincidences, like Mendelssohn’s contribution to rescue what is now one of the most famous names in classical music? Where are all the famous girl bands in rock music ? Which girl band was pushed to the side in order for the Floyds, Beatles, Zeppelin, Stones to come through ? Why is there no gender equality in rock music?!!! Jealousy, and Ignorance leads to ignorant conclusions, ignorant questions, and ignorant inquisitions. I don’t know who you are but if you are white, I am sure you spend a lot of time explaining racism to people of colour, too, don’t you? As a professional artist, I had no idea there were women painters befor Mary Cassatt until I was 28! All,I have a very clear memory of a story in a school reader about the Mozart Wunderkinder…1962 it was. So much for Anna-Maria being ignored by history. At that time, we had not yet had the onslaught of various feminist groups. They all later came to have a point. But the facts remain even now, to support contentions that womens work worth, exploits,value and achievements have been studiously devalued, and that continues to this day. Yet another version of the “history is written by the winners” paradigm. Not all winners have been fair or worthy.